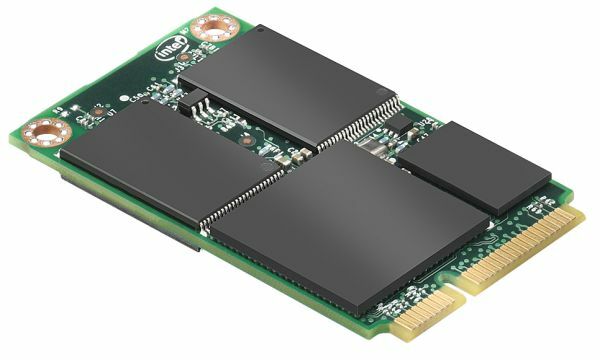 Although not quite the Intel SSD announcement we were expecting in Q4, today Intel unveiled its first mSATA SSD: the Intel SSD 310. Based on the 34nm Intel X25-M G2 controller, the 310 will be available in both 40GB and 80GB capacities. The 80GB version should perform a bit slower than an 80GB X25-M G2 while the 40GB version will perform like a 40GB X25-V. The 310 isn’t about performance, rather form factor. The SSD in Apple’s new MacBook Air is just the beginning - OEMs are beginning to shed the limits of traditional hard drive form factors as SSDs don’t need to house a circular platter. The mSATA interface is physically a mini PCIe connector (similar to what you’d see with a WiFi card in a notebook) but electrically SATA. The result is something very compact. The full sized mSATA 310 measures 50.8mm x 29.85mm and is less than 4.85mm thick. Total weight? Less than 10 grams. The Intel SSD 310 is OEM only at this point. Lenovo has already announced it will offer the 310 in ThinkPads in the future, while DRS Technologies will show off a tablet PC next month with the 310 inside. The 40GB drive is priced at $99 while the 80GB version will run you $179 in 1000 unit quantities. As for the rest of Intel’s SSD updated lineup? While internal roadmaps showed a Q4 release for the 3rd generation X25-M based on 25nm NAND, that product is obviously delayed. We’re also hearing that new SandForce drives are still months away so those of you eagerly waiting for new drives at the high end will have to wait a bit longer. 15 or even 14" machines could get nicely smaller while fit two of these. This is definitely where things are going. It's been obvious to me for a year and to smart folks for more like two. Isn't that the Libraries feature in Win7? Uhh... I have been separating my data and OS/Programs on separate drives for years. The reason I did this was not for performance, but to make reinstalling the OS easier. I know from experience that every version of Windows since XP has been able to relocate the "special folders" (My Ducuments, Downloads, My Pictures, My Videos, My Music) to anywhere on any drive. XP required Tweak UI, a free Power Toy from Microsoft, but 7 has the functionality built-in. It takes a little effort to set up, but after that, it is pretty seamless. In fact, I found that it was actually nicer because if you needed to actually navigate to a "special folder" without using a shortcut all you can to do is go to Data Drive:\Special Folder instead of C:\Documents and Settings\Username\My Documents. I know that all of my example folder names are XP, but anyone here who uses 7/Vista knows the 7/Vista equivalent (Remove the "My"s and replace "Documents and Settings" with "Users"). ImSpartacus has a point about Libraries in Windows 7, but that is not very seamless, and it seems to be somewhat buggy. This is why the hard drives with flash don't act as two separate drives. As the flash wears out, it can be treated as a cache of gradually decreasing size, much as an SSD can gracefully lose capacity over its lifetime. And for the space, I'd gladly offer my DVD-drive. I've used it once since I got my laptop half a year ago. Even used a USB-stick for Windows. The first manufacturer giving a good, high-res display in a 14" og 15" with 4+ battery life, decent processor and decent switchable graphics, in addition to a SSD / HDD combo, will make some serious money. Proper touchpad drivers, and it would be a killer without equal.